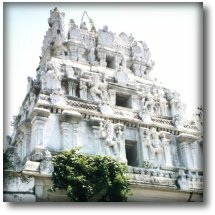 Sri Subramanya Swami temple, at Sholinganallur, on the I.T. Highway, 12kms from Adayar, is situated in the midst of Classic Farms - a lush green surrounding with peaceful, pleasing environment that soars up your spirits and your vibration, Other deities like Ganapathy, Maha Vishnu, Mahalakshmi, Saptha Maadhar, and Navagrahas are also there. Special poojas, abishekam, thrisathi archanas, homams, are performed on request. The place was known for its holiness, as saint Agathiar visited and worshiped Lord Shiva.